In the French city of Saint-Nazaire, queues of yellow vesters have been videoed withdrawing money from the banks on or around January 12th in what appears to be a symbolic move to show what tools the people can have. Some 400,000 people showed up last Saturday according to yellow vesters with Act 10 now called for tomorrow in what is beginning to feel like the brink of a peaceful revolution. “Paris is back for Act 10 of the protest! Debating won’t solve anything, everybody knows what the people are asking for! Less elected officials, less privileges, more transparency and for the people to be systematically consulted in case of disagreement! A democracy, a real democracy!” – a yellow vester said. 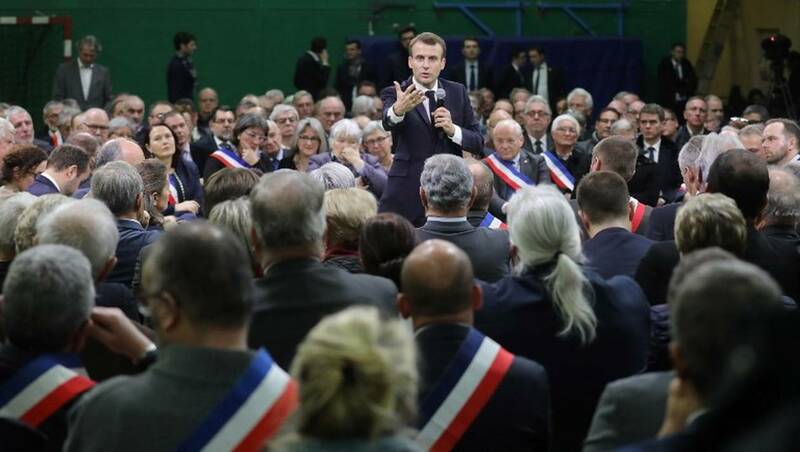 French President Emmanuel Macron with some 600 mayors who will relay the concerns aired by residents in their towns and villages in the Normandy city of Grand Bourgtheroulde on January 15, 2019. France, Europe and the world stand at cross roads as what some thought was just protests appears to be an attempt at revolutionizing the political system. It all seems to have begun on November 17th when workers at the Saint-Nazaire shipyard issued a communique on November 20th calling for an economic blockade. “Our goal is to regain decision making power for the people,” they said. Since then, the people have shown up in the hundreds of thousands across France for now two months. Their number one demand is a jury like parliament and/or citizen proposed referendums. The reasons for this so far generally peaceful revolt may be numerous, but the young millennial who read the communique probably symbolizes the greater picture. A generational transition of power is on-going between the baby boomers and the millennials. The latter have or are gaining key positions. They, having grown up with the internet which has informed greatly, don’t like how certain things are done and thus demand certain changes. The latest example is Theresa May’s continued hold of power despite two no-confidence votes. In such key moment in British history, you’d think a general election would be required so that the winning party can have a mandate for the flavor of Brexit. The people, however, have no way of forcing their voice to be heard except by taking to the streets. The latter is very costly and can even be ignored unless it is at such a scale that one might call it an attempt at peaceful revolution. Since the 60s civil rights movement, Western Europe has seen nothing like what is currently going on in France. It appears to be a very unique moment in time for it may well be the case the millennials get what they want: a people’s parliament. There, all other issues can then be discussed. There, a no-confidence vote can then be outside of rigid party lines. There, every single citizen, by the draw of random luck, can have the opportunity to have a say and sway in all matters. The idea so simple, one does wonder whether anyone – rich or poor – would actually be against it considering they all might randomly be chosen, whether policeman or rebel, intellectual or of little intellect. Effectively the entire country through a sample of it in the number 500 or so. Then people can have their say peacefully in the people’s parliament, rather than being required to take to the streets and even then easily fail as in 2003. The movement appears to be spreading in Sofia, in Berlin, in Brussels, and in pockets of Britain. Some say they are far left, some say they are far right, but their number one demand appears to be quite centrist. In France, however, it appears to have reached the scale of effectively the entire nation. The biggest question being: how is this now to be resolved. Macron is holding debates, quite appropriately, but yellow vesterst may also be right in saying Macron knows very well what they want. Debate, however, would still be needed to flesh out how the potential new system of governance would work, just as perhaps it would be far more appropriate to have this debate under a binding referendum. Then, the yellow vesters perhaps would not need the streets any longer. While where it concerns just talk, they may well think it is just a distraction tactic. For France and for Europe, Macron should call two binding referendums. Yes or no to a jury style people’s parliament. Yes or no to citizen proposed referendums. With the movement growing and with their revolutionary spirit already shown by their attempts to take over media stations, delay in calling such binding referendums may well be costly. to fully hold the tongue. the liberating mother of mankind.